Heat sesame oil in a large skillet and place over medium heat. Add white parts of green onions, diced red onion and garlic. Sauté, stirring frequently, until red onion begins to soften, about 4-5 minutes. Add ground pork, grated ginger, and 2 tbsp of Thai peanut sauce, lightly season with salt and pepper and cook until pork is browned, breaking up the pork while cooking, about 7-10 minutes. Add kale coleslaw mix, shredded cabbage, coconut aminos (or soy sauce), rice wine vinegar, salt & pepper to taste, and stir until well combined. Cook, stirring regularly, until cabbage is tender, about 5 minutes. 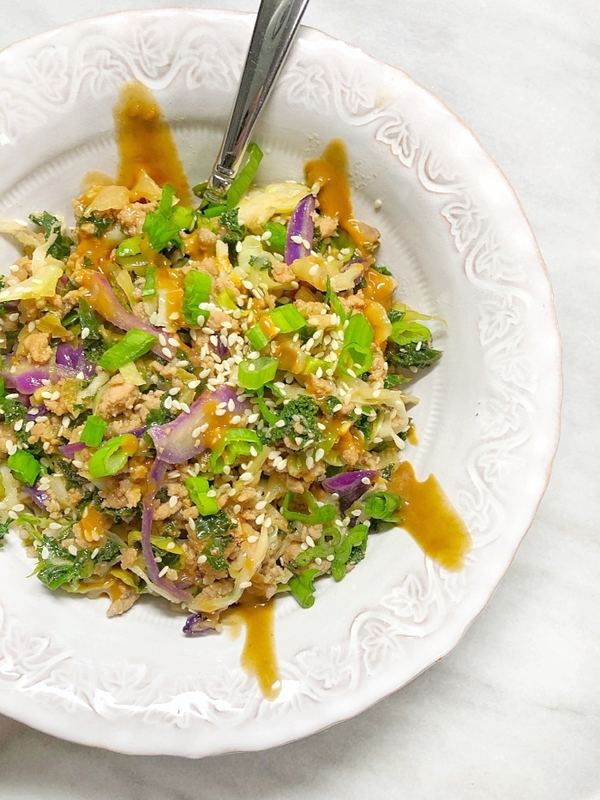 Serve while hot and top with green top of scallions, sesame seeds and a drizzle of Thai peanut sauce and/or hot sauce, if desired. Don't miss out! Sign up below!